Going to work every day or at least five days out of seven is a given for most adults. Unfortunately, a small percentage of working people truly enjoy what they do. They consider the job a daily grind or necessary evil as a “ways to the means” of providing. That is a shame considering the fact that more time is spent at work in comparison to time at home with family.On the other side of the coin are those that have found their calling in their profession. Going to work is a joy and a way to fuel their creative juices. When placed in this kind of environment, one’s skill sets excel. This is a win-win situation for everyone involved as full productivity is more easily achieved. A case in point is Rich Mitchell and his family. They are a perfect example of people that love their jobs. Rich is the owner and operator of Mossy Head Lumber Company. Their specialty is recovering and milling river and swamp sinker logs. Rich perfected his talent over the years learning the trade while working for other large lumber mills. Eventually, he honed his skills and knowledge of the exquisite wood and ventured out on his own to chase his dream of having his own reclaimed saw mill. It hasn’t been an easy task to build a new business from the ground up (literally) but well worth the blood, sweat and tears it has taken to get all the tools necessary to make it a successful endeavor. Part of those tools are human ones that come in the form of hands provided by Rich’s sons, Corey and Steve. They are present daily providing not only physical support but emotional support too. Daughter, Lucy, recently joined the ranks to run the day to day office duties and learn the mill process. 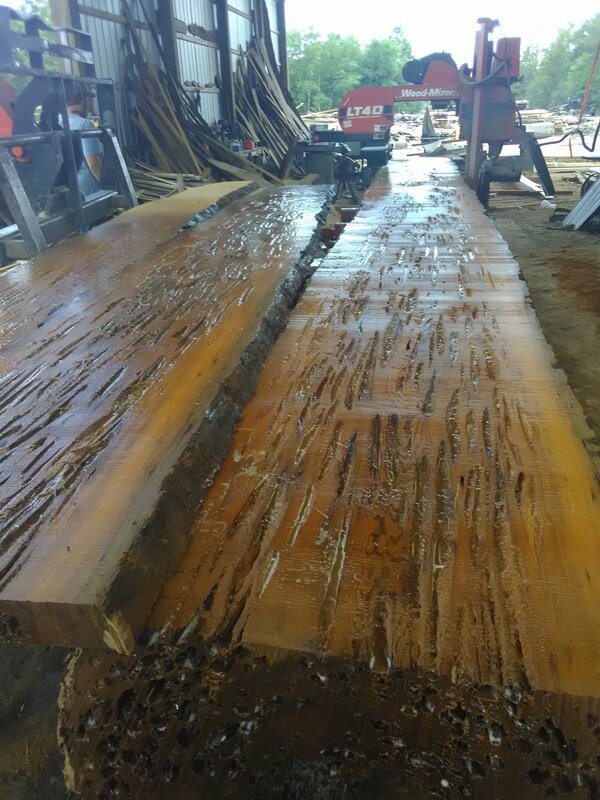 Together they form a phenomenal team and share their passion for the natural beauty of sinker cypress and other river and swamp reclaimed logs. They love providing tried and true building materials to individuals, builders, architects, supply houses and more but also thrive on seeing them converted into works of art such as hardwood flooring, decorative beams, doors, paneling, etc. The Mitchells look forward to every day on the job because they say “every log is different and you never know what you’re going to find within”. The pure, natural beauty they find is what motivates them to work diligently. Not only do they have the great passion for the reclaiming and milling of the sinker logs but a love of being able to work side by side each and every day. Rich says, “We have sawdust in our blood and we’ll be doing this for a long time to come”. Contact Mossy Head Lumber Company for any of your spectacular wood needs. They’re looking forward to hearing from you and sharing their love and passion for river and swamp reclaimed wood.